Parking: Please park at the Park & Ride located just to the west of the Brown Deer Road exit of I-43. A free shuttle bus will run between the Park & Ride and Lynden, 10 am-6 pm. If you require handicap access, you may park in the lot at Lynden. Lynden opens its doors to the community for a Free Family Day featuring artists’ responses to Eliza’s Peculiar Cabinet of Curiosities, artist Fo Wilson’s installation on the grounds at Lynden. 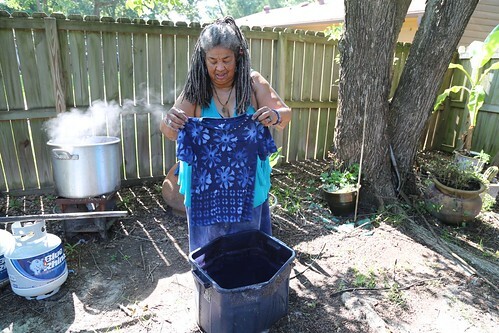 This free family day will have a Gullah flavor, with artist-in-residence Portia Cobb onsite at her project, Lizzie’s Garden, and her guest, South Carolina-based textile artist Arianne King Comer, leading a day-long communal dyeing project that explores the textile traditions of the Sea Islands and their relation to other cultures. At 4 pm, Milwaukee’s own SistaStrings will offer another intimate concert on the porch of the cabinet. Bring a picnic and enjoy a day on the grounds. Arianne King Comer kicks off her mini-residency, IBILE! : Ancestral Call in Cloth, with a day of communal resist-dyeing. Focusing on shibori (Japanese) and adire (Yoruba) methods, Comer will preside over the dye vats, inviting visitors to collect interesting found objects on the grounds to create resist patterns when they dip. Bring your 100% cotton or silk clothes, tablecloths or napkins and trans form them into wearable and functional art. If you are bringing new items, be sure to wash them beforehand. We will have a small supply of garments on hand for those who need them. Cool off inside the house where we will be showing a selection of videos about the indigo process in different places around the world. The new Bonsai Exhibit at Lynden will be open, with members of the Milwaukee Bonsai Society on hand to answer questions. Use our handy information sheet to take a self-guided walk through Lynden's prairies to learn some of Wisconsin's most beautiful native flowers. Pick one of each specimen and take home a seasonal native prairie bouquet. Complete two different types of scavenger hunt: one for trees and one for sculpture! Alight in the formal garden and discover the winged ones who live among the flowers. Magnifying lens and binoculars will enhance your vision. Complete your visit with a bird, bee, or butterfly finger puppet of your own. Stop by the small pond to learn about the types of toads and frogs that call Lynden their home, and fold an origami frog of your own. Master Gardeners will be on hand to lead visitors through our pollinator gardens and offer gardening advice. Artist-in-residence Gary John Gresl will be offering informal tours of his installation, The Body Farm at Lynden from 11 am to 1 pm. Using Lynden's iconic sculptures as checkpoints, we will navigate the front lawn using a simple map and compass to teach basic orienteering skills. Kyle Welna, Lynden's assistant land manager, will introduce beginners to the technique at 11 am and 2 pm. If you already know your way around a map and compass, pick up a map anytime and get started. Under the willow tree behind waterfall hill, we’ll be make bracelets, tiaras, and necklaces using materials collected from Lynden: willow branches, cattail reed, and flowers. Our series of intimate concerts on the porch of Eliza's Cabinet, artist Fo Wilson's installation on the grounds at Lynden, continues with a performance by Milwaukee's SistaStrings. The project of Monique and Chauntee Ross, SistaStrings explores the possibilities of creating social change through music.